Kids can experiment with watercolors and color mixing in this beginner’s class! Instructor, Joanne Ogle, will guide participants in exploring the fun effects if watercolor paints. First, kids will be introduced to many of the tools that can be used for watercolor painting including different brushes, paper choices, masking tapes and fluids and much more. Then kids will create a color wheel that will show them how to make all colors imaginable from the three primary colors. Finally, Joanne will guide them through the simple steps of creating a landscape using all of the recently learned tools and techniques. Children of all skill levels are welcome. Class size is limited to 12 participants. Class Fee for this two-day workshop: $20 CAM members / $30 non-members. Registration ends July 14, 2016. 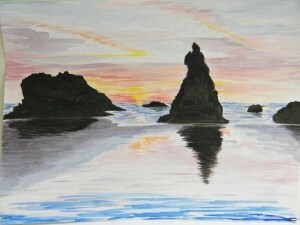 For registration go to www.coosart.org or visit Coos Art Museum at 235 Anderson in Downtown Coos Bay.